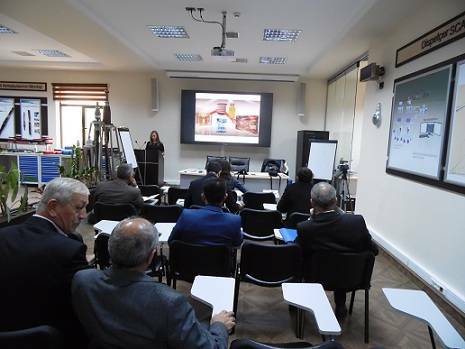 From 12 October to 16 October 2015, a delegation from GlobeCore paid a working visit to Azerbaijan. GlobeCore’s representatives visited Baku and Ganja where they made four presentations and a demonstration of GlobeCore’s UVR-L type laboratory unit. The power supply specialists who were in attendance at the presentation were shown in detail the different lines of fuel oil processing units and equipment designated for maintenance of electric power transformers. GlobeCore’s products are focused on improving the reliability and economic efficiency of the processes of generation and distribution of electricity. This is achieved by the cleaning and reclamation of dielectric transformer oil. Judging by the large number of questions, the audience was keenly interested in the topic of discussion. Each presentation was completed with a demonstration of the capabilities of GlobeCore equipment using a UVR-type laboratory version unit for the demonstrations. All the participants were able to observe firsthand the transformation of oxidized transformer oil into a product suitable for further use in a power transformer. The people and managers at GlobeCore expresses their gratitude to all the participants and organizers of the presentation for your interest in our products and allowing us to answer your questions.